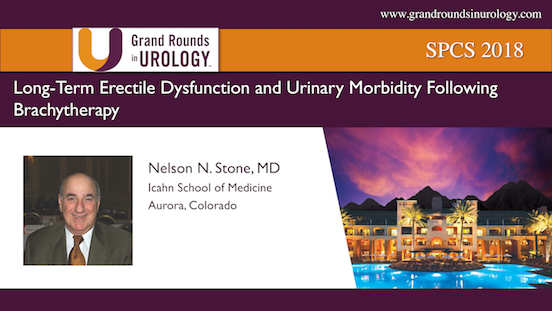 Nelson N. Stone, MD, discusses changes in urinary symptoms and erectile function, as measured by the International Prostate Symptom Score (IPPS), at 10 and 15 years following prostate brachytherapy. Subsequently, he advises clinicians on best practices in seed implantation and long-term management to optimize cancer control and minimize adverse symptoms. Nelson N. Stone, MD, Founder and CEO/President of 3DBiopsy™, discusses how his comprehensive system aides in accurately identifying Gleason scores and guiding focal therapy. He and 3DBiopsy™ co-founders, E. David Crawford, MD, and M. Scott Lucia, MD, perform a demonstration of the system’s needle, actuator, pathology carrier, and 3D mapping software. Nelson N. Stone, MD, argues that performing prostate biopsies is beneficial for detecting malignancies and lesions and cannot be replaced by MRI, despite controversies. He describes the transperineal mapping biopsy (TPMB) procedure, the inadequacies of current technology, targeted focal therapy, and future directions in these techniques.